Without its predecessors, OpenMPT would not be what it is today. In the mid-90s, Olivier Lapicque wrote the ModPlugin for web browsers, based on his previous Mod95 player. While GeoCities sites were still threatening their visitors with MIDI music and MP3 was not very common yet, this plugin brought the small module files into the world of websites. Shortly after, ModPlug Tracker development started. Together with Buzz, it was the first real tracker software for Windows. The first alpha and beta versions were released in late 1997. While it might have looked a bit different back then, it is still the base of OpenMPT and this is where it all started. ModPlug Tracker evolved over the years, until Olivier decided to release the source code to the public on 21 January 2004, so that other people could continue working on it. Previously developed under the name "MPT Wild! 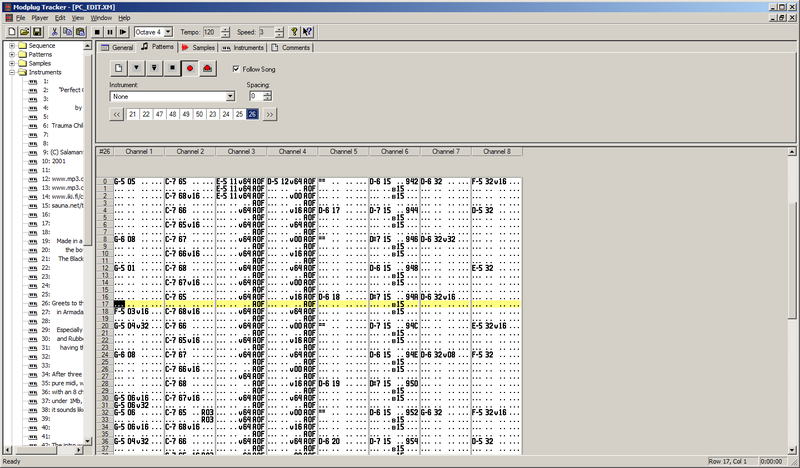 ", Open ModPlug Tracker (or simply OpenMPT) is today's most actively developed spin-off of ModPlug Tracker. There are other, mostly personal branches by individuals, for example modplug23, which is the origin of some of the earlier features added to OpenMPT. But parts of the code have been opened before that. 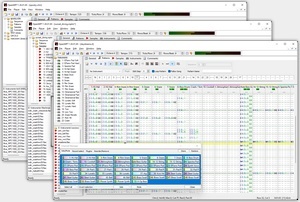 In December 1999, Olivier sent the module-playing parts of ModPlug Trackers's source code to Kenton Varda, licensed under the GPL, to write a plugin for XMMS based on the code. The source code was later released to the public domain, and the mod-playing code was split off into a separate library, libmodplug, maintained as part of the ModPlug XMMS Plugin project. Today, libmodplug comes pre-installed on many Linux distributions and serves as a base for many other players and trackers such as Schism Tracker. However, unlike libopenmpt, libmodplug is not created from the same source code as OpenMPT and thus misses many bugfixes and lags behind in terms of playback quality and portability. Get the last released version, ModPlug Player 1.46 (27 September 2002), or have a look at the archive, where we have some older versions of ModPlug Player available. If you need a good, up-to-date module player, grab the OpenMPT input plugins for XMPlay, Winamp and Foobar2000 instead! Get the last released version, ModPlug Tracker 1.16 (28 January 2004), or have a look at the archive, where we have some older versions of ModPlug Tracker available. It is usually not necessary to run an old version of ModPlug Tracker, even if some people might want to convince you of the opposite - this is especially true if you have never worked with ModPlug Tracker before. Get the last released version of the ModPlugin (16 April 2000). Sadly, no previous versions are available for now.